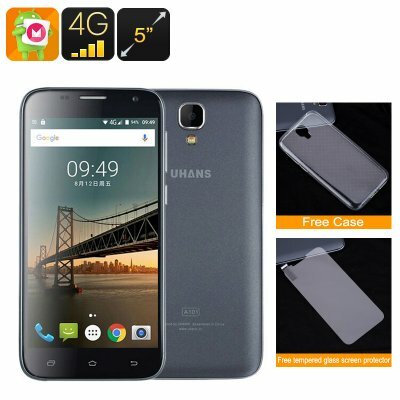 Successfully Added UHANS A101 Android Smartphone - 5 Inch HD Display, Android 6.0, Dual-SIM, 4G, Quad-Core CPU, Dual-IMEI (Black) to your Shopping Cart. The UHANS A101 is a beautifully designed 5 inch smartphone that holds an HD display that lets you enjoy all your media and mobile files in their fullest glory. With a metal paint coated housing this Chinese smartphone features a modern and high-end design that both feels great to hold and looks good to the eye. Coming with some decent hardware this Android device does not only look stylish from the outside, it also holds enough power to keep up with your daily activities without dropping a single frame. With its android 6.0 Operating System the UHANS A101 is guaranteed to deliver a smooth user experience and provides you with the latest features that the mobile industry has to offer. Gesture sensing technology allows you to navigate through your smartphone without the need to actually touch your display and 4G connectivity lets you enjoy the fastest mobile data speeds out there. Download the latest Apps, games, movies, and more through the Play Store in a blink of an eye and enjoy them in stunning quality on a 5 inch HD Display. With this Android device you have the perfect platform at hand to enjoy countless hours of mobile entertainment, ensuring that no matter where you’re headed there is no need to feel bored any time soon. Insert two SIM cards and be connected to two mobile providers simultaneously. Holding Dual-SIM card slots and two IMEI numbers the UHANS A101 Android smartphone allows you to be reachable on two different phone numbers any time, any where. Packing a 2450mAh battery this Chinese smartphone offers up to 4 hours continuous usage time - enough to browse the web and enjoy all your mobile entertainment throughout the day without the need to worry about running out of juice. Featuring a Quad-Core CPU at 1.3GHz that has been backed up by 1GB of RAM this Chinese smartphone can effortlessly handle multi-tasking and the latest mobile applications. Giving the option to add up to 64GB of external memory the UHANS A101 is guaranteed to provide you with enough space to store all your media, games, and files. Browse the web, play games, or enjoy an HD movie - with this Android phone you will never run out of options to keep yourself entertained throughout the day. The UHANS A101 comes with a 12 months warranty, brought to you by the leader in Android smartphones as well as wholesale electronic gadgets..